Did outfielder Joe Riggert actually manage even before he began his 20 year career as a player? If nothing else, he seems to have managed in his first season. His career began started in 1909 with seven games for the Abilene Red Sox in the Central Kansas League; he hit .375 in the very small sample. Riggert then joined the Lyons Lions team in the Kansas State League. Both leagues were Class D circuits. Riggert appeared in 95 games for Lyons and hit .269, but may also have been manager of the team – or at least one of the team’s four managers. The team finished in first place in the eight-team league, with Cecil Bankhead listed as manager. Riggert split his 1910 season between Lyons for 90 games (with 13 home runs) and then to the Class A Omaha Rourkes (Western League). With Omaha, he hit over .300 again (.331) in 62 games. And then, in 1911, Riggert managed in the Three-I League (Illinois-Indiana-Iowa) for the Quincy Infants, one of two managers. He was succeeded by Bade Myers, who, unlike Riggert, was a player-manager. But first, Riggert had a chance to play in the major leagues. Joseph Aloysius Riggert was born in Janesville, Wisconsin, on December 11, 1886, to a barber, Charles Riggert, and his wife, Mary. The family lived in Wyandotte in 1900, but soon moved to Kansas City. Riggert attended St. John Catholic school for eight years, but did not continue on to high school. He played semipro ball there as a catcher with the Union Club, the same team with which Hall of Famer Zach Wheat got his start. Wheat and Riggert later played on the same Boston Braves team in 1919. Riggert played for four major-league teams in three seasons between 1911 and 1919 and wrapped up his big-league career before returning to another ten seasons in the minors from 1919 to 1928. First up was the Boston Red Sox, where he hoped to make the team under manager Patsy Donovan. He played in more games than anyone on the team during 1911 spring training – 29 of them – and hit for a .292 average with a pair of home runs and six triples.3 Even before the cross-country training trip had launched, Riggert was team owner John I. Taylor’s pick to make the squad.4 Among other things, Taylor was impressed with his 36 stolen bases in 1910. And Riggert was an aggressive outfielder, throwing out a runner heading to second base on an otherwise routine single to short left field in a March 2 game in Los Angeles. Riggert didn’t break any fences down during the regular season, though. He did hit two homers – both of them inside-the-park homers. The first came on August 11 in Philadelphia, off future Hall of Famer Chief Bender. The second came on October 7 at Boston’s Huntington Avenue Grounds, in the eighth inning on the last day of the season. It was the last home run ever hit in the ballpark, since the Red Sox moved to Fenway Park to open the 1912 season. Washington’s Charlie Becker served up Riggert’s blast in an 8-1 loss. Joe Riggert did enjoy one of the best debuts a Red Sox batter has ever had. On May 12 the team was in Cleveland, with Eddie Cicotte starting against Cleveland’s Willie Mitchell. Tris Speaker had been hit on the wrist the day before and couldn’t play, so Riggert took his place in center field and batted third in the order. The Naps held a 1-0 lead through five innings, but in the top of the sixth Riggert singled to drive in Larry Gardner and then came around to score himself after singles by Duffy Lewis and Hack Engle. It was 3-2 Red Sox after six innings. Riggert came up again in the seventh with two outs and the bases loaded and drove a triple over Shoeless Joe Jackson’s head in center field – he had four RBIs and one run scored in the 6-2 win. Riggert would have had a longer season but was beaned by New York’s Ray Caldwell on May 31 and knocked unconscious. This cost him a number of games. Riggert appeared in 50 games, hitting .212 with 13 RBIs and 19 runs scored. After the season ended the Red Sox sold his contract to the St. Paul Saints. He hit a disappointing .240 for St. Paul in 1912. At the end of July or in very early August, St. Paul sold his contract to the Wilkes-Barre Barons of the New York State League.5 He had time to get into 47 games for the Barons, and hit. 319. Riggert was fifth on the outfield depth chart, and had his chance earlier in the season, getting into 27 games and playing strong defense, with a very good arm, but hitting a disappointing .193. 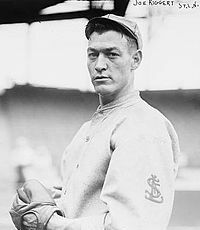 At one point, playing alongside Zach Wheat and Casey Stengel, Riggert was part of what was called an “all-Kansas outfield.” On June 27, his contract was purchased by the St. Louis Cardinals. He was marginally better under manager Miller Huggins, .213, playing in 34 games. In April 1915 St. Louis sold Riggert’s contract to St. Paul. He played for the Saints again for the next four years. He was remarkably consistent the first three years, hitting in the .280s each year, with almost the same number of homers each year (9, 9, and 8), and playing in an average of just over 150 games. In 1918, with the seasons of baseball teams around the country cut short because of the World War, he played in 78 games. He hit .325 in that war-shortened season. Riggert’s error rate in 1919 was high, nine of them and a .950 fielding percentage in center field. He had a run-in with Stallings about his fielding. The Cincinnati Post explained, “Joe Riggert, usually a quiet fellow, was called down by George Stallings for permitting a ball Jake Daubert hit way over his head to get away. Joe surprised his team mates by coming back at Stallings with a hair curling line of language.”13 On July 23, his contract was sold back to St. Paul. Joe and Cora still had their home in Kansas City, Missouri, but Joe saw a lot more of Minnesota’s Twin Cities, playing for St. Paul for the rest of 1919 and through the 1924 season. In 1919 St. Paul won the American Association pennant by 6½ games. This was Riggert’s first championship. In 1920 manager Mike Kelley and the Saints repeated, this time cruising to another flag, winning by 28 games over second-place Louisville and its leader, Joe McCarthy. In 1922 St. Paul won its third pennant in four years. The Saints missed by two games in 1923, but came back and took another in 1924. In 1925, after 12 years with St. Paul, and in the year he turned 38, Riggert took a position with another team, the Tulsa Oilers in the Western League. He played in 160 games for Tulsa, hitting .348 with a career-high 21 homers. In his second season, 1926, he hit .298 with 17 homers. Riggert’s last two years playing ball were back in the Three-I League, with Quincy again. He played a full schedule – 134 games (.314 and nine homers) in 1926 and 130 games (.275 with 11 homers) in 1927. Then it was time to hang them up. He was 41 years old. After he left baseball, Riggert became the manager of a cigar stand at the Jackson County Court House in Kansas City, working there at the time the census enumerator gathered his data in 1930. He worked there for ten years. In 1940, he and Cora were still in K.C., with Joe working as foreman of WPA project 8410. What the project did, we did not investigate. After Cora died, Riggert married Catherine McKinley in September 1942. Joe Riggert died at home the day before he would have turned 87, on December 10, 1973, in Kansas City, Missouri. In addition to the sources noted in this biography, the authors also accessed Riggert’s player file and player questionnaire from the National Baseball Hall of Fame, the Encyclopedia of Minor League Baseball, Retrosheet.org, and Baseball-Reference.com. 1 Unidentified March 25, 1914, newspaper clipping in Riggert’s Baseball Hall of Fame player file. 2 A.H.C. Mitchell, writing in the November 25, 1911, Sporting Life. 3 Boston Journal, April 10, 1911. 4 Bill Nowlin, The Great Red Sox Spring Training Tour of 1911: Sixty-Three Games, Coast to Coast (Jefferson, North Carolina: McFarland, 2010), 19. 5 Sporting Life, August 10, 1912. 6 Sporting Life, March 1, 1913. 7 The Repository (Canton, Ohio), July 9, 1914. 8 Sporting Life, January 3 and 10, 1914. 9 Sporting Life, January 31, 1914. 10 Baseball Magazine, February 1914. 11 Philadelphia Inquirer, January 26, 1919. 12 Boston Globe, July 4, 1919. 13 Cincinnati Post, July 9, 1919. 14 Obituary in unidentified newspaper clipping in Riggert’s Hall of Fame player file.